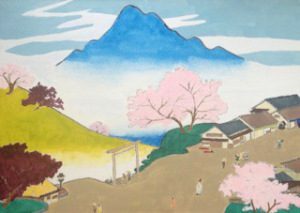 Recently, the modern Japanese artist, Sawako Utsumi, produced two stunning pieces of art based on the fusions of ukiyo-e, the gentle influence of Shintoism and the power of nature. These two pieces of art are titled the Spirit of Ukiyo-e in the Light of Shinto and Spirit of Shinto and Ukiyo-e in the Light of Nature. Therefore, Utsumi is focused on bringing these two art pieces together based on delightful color schemes, playing on nature, the mystery of the mind, the lasting legacy of ukiyo-e, and the endless influence of the Shinto faith that remains within easy reach. Another adorable feature in both art pieces is the concept of creating reality and unreality. This is based on delightful color schemes, the natural seasons of nature, and unique angles in relation to faith and senses . At the same time, time and motion enter the realm of idealism. 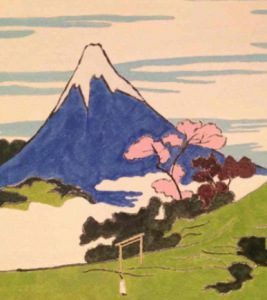 Intriguingly, while ukiyo-e is clearly alluded to, the gentle theme of the Shinto faith remains almost distant, despite being visible. Obviously, the idea of this is to highlight how Shintoism and nature fuse together. This theme runs deeply throughout other art pieces by Utsumi, irrespective if personal landscapes, highlighting the power of old Dutch art, paying respect to artists like L. S. Lowry but based on personal color schemes, illuminating traditional Japanese art themes – and other aspects of Utsumi’s art. 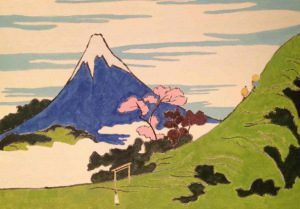 Turning back to the two art pieces highlighted in this article, then color schemes enter the realms of Shintoism based on mystery. 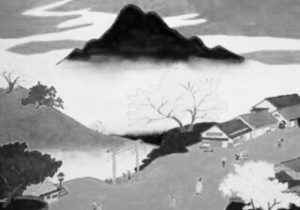 Indeed, the power of spirits, nature, ancestors, and other areas that flow within the Shinto faith, clearly inspire Utsumi to reach new inner senses. 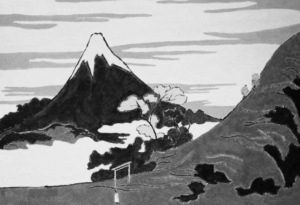 However, this intriguing modern Japanese artist desires to sidestep natural reality in the two art pieces highlighted, in order to illuminate the impact of ukiyo-e and the Shinto faith within the body politic.